Former tennis champion Jana Novotna has died of cancer at the age of 49. The Women’s Tennis Association (WTA) said Jana Novotna “died peacefully, surrounded by her family”. She had lost in the Wimbledon final in 1993 and 1997 before winning the Grand Slam tournament when she beat Nathalie Tauziat in 1998. The Czech player captured the hearts of fans when she burst into tears after losing to Steffi Graf in 1993 and was consoled by the Duchess of Kent. WTA chief executive Steve Simon said: “Jana was an inspiration both on and off court to anyone who had the opportunity to know her. Jana Novotna was renowned for her serve and volley game and achieved a career-high singles ranking of No 2. 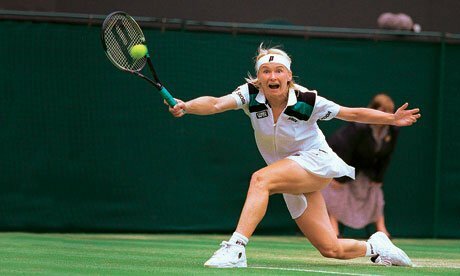 In addition to her only singles Grand Slam win at Wimbledon, Jana Novotna claimed 12 Grand Slam doubles titles and four in mixed doubles. Jana Novotna was inducted into the Tennis Hall of Fame in 2005.